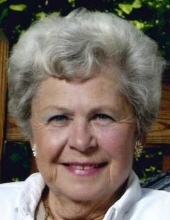 Union – Anna Beth Collett (Nee: Hehl), 90, peacefully entered into eternal rest on Wednesday, January 30, 2019, at her residence. She is preceded in death by her husband of 68 years, John Edward Collett, as well as her sister, Leah Budde. Anna Beth will be greatly missed by her children, John E. Collett, Jr. (Marcy), Norma Rolf (Phil), Emilea Bondick (Steve), Franc C. Collett, and Mark R. Collett; her 7 Grandchildren; and her 9 Great-Grandchildren. She will be remembered as a very hospitable and artistically talented woman, especially when it came to ceramics. She also enjoyed gardening. Above all, Anna Beth cherished and adored her children, grandchildren and great-grandchildren. She will be greatly missed by all who knew and loved her. Visitation will take place on Tuesday, February 5, 2019, at St. Timothy Catholic Church, 10272 US-42, Union, Kentucky 41091, beginning at 9:00 a.m. until the Mass of Christian Burial at 10:00 a.m. Burial will immediately follow at Mother of God Cemetery, Ft. Wright, Kentucky. In lieu of flowers, memorials are suggested to: Franciscan Daughters of Mary, P.O. Box 122070, Covington, Kentucky 41012. Stith Funeral Home, Florence is serving the family. Online condolences may be left at: www.stithfuneralhomes.com. To send flowers or a remembrance gift to the family of Anna Beth Hehl Collett, please visit our Tribute Store. "Email Address" would like to share the life celebration of Anna Beth Hehl Collett. Click on the "link" to go to share a favorite memory or leave a condolence message for the family.